AKIPRESS.COM - Russian President Vladimir Putin has announced that 755 staff must leave US diplomatic missions, in retaliation for new US sanctions against Moscow, BBC reports. It brings staff levels to 455, the same as Russia's complement in Washington. This is thought to be the largest expulsion of diplomats from any country in modern history, says the BBC's Laura Bicker in Washington. The number includes Russian employees of the US diplomatic missions across Russia, the BBC's Sarah Rainsford in Moscow adds. 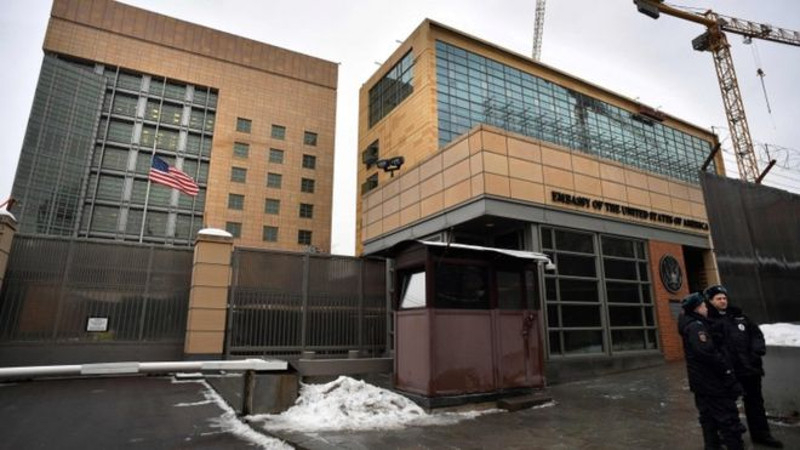 Mr Putin told Russian television: "More than 1,000 people were working and are still working" at the US embassy and consulates, and that "755 people must stop their activities in Russia." Mr Putin suggested he could consider more measures, but said: "I am against it as of today." However, in terms of general relations, he added: "We have waited long enough, hoping that the situation would perhaps change for the better. "But it seems that even if the situation is changing, it's not for anytime soon." The new US sanctions were in retaliation both for Russia's annexation of Crimea in 2014 and Russian interference in the US election. In December, the Obama administration ordered the seizure of two Russian diplomatic compounds and expelled 35 Russian diplomats in response to alleged hacking of the US Democratic Party and Hillary Clinton's campaign.